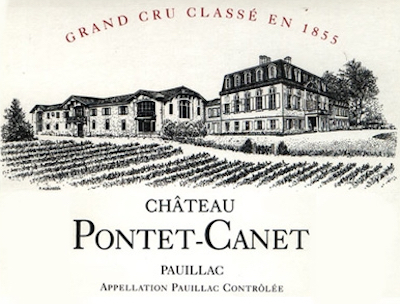 Château Pontet-Canet is a large Pauillac estate that can trace its origins back to 1725, when Jean-François Pontet gave his name to the estate he had acquired. The wine was not château-bottled until 1972 and in 1975 the property was sold to Guy Tesseron, of the Tesseron family, one of the finest exponents of luxury, very old, aged Cognacs (Cognac Tesseron). The Tesserons also own Château Lafon-Rochet in St-Estephe. Today, Château Pontet-Canet is owned and run by Alfred and Michel Tesseron. Pontet-Canet's 78 hectares of vineyards adjoin those of Mouton Rothschild and are planted with Cabernet Sauvignon (63%), Merlot (32%) and Cabernet Franc (5%). The Tesserons have vastly improved the quality of the Pontet-Canet wines which are now full-bodied and packed with ripe, chewy, black fruits and finely integrated tannins. The wines posseses marvellous ageing potential. Pontet-Canet is classified as a 5ème Cru Classé.